It must have been a challenge for Brandon and Kaffe to decide what to bring for a trunk show and what to leave behind. They have so many incredible designs to their names. This was, by far, the most popular item with the group of knitters - partly because of the design, partly because of the softness of the yarn. The yarn is Colorspun - a wool/mohair blend. Brandon said that he took his inspiration from the chest of an owl. 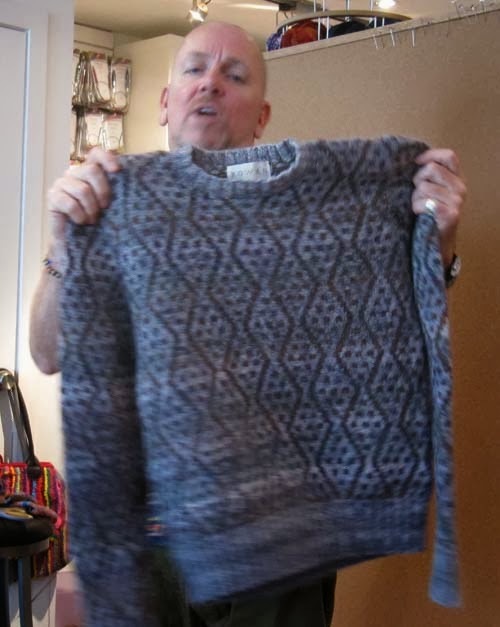 Rowan named the sweater "Balkan", which he didn't care for. If you're a Rowan subscriber the pattern is free, here. For me, this design falls into the Irish Spring" category. Do you remember the soap commercial? Made for a man, but I like it too! Sorry for the blurry photo. Brandon was moving! Bet you liked the one with houses.